Ichthyosis refers to a relatively uncommon group of skin disorders characterized by the presence of excessive amounts of dry surface scales. It is regarded as a disorder of keratinization or cornification, and it is due to abnormal epidermal differentiation or metabolism. The ichthyosiform dermatoses may be classified according to clinical manifestations, genetic presentation,  and histologic findings. Inherited and acquired forms of ichthyosis have been described, and ocular alterations may occur in specific subtypes. Five distinct types of inherited ichthyosis are noted, as follows: ichthyosis vulgaris, lamellar ichthyosis, epidermolytic hyperkeratosis, congenital ichthyosiform erythroderma, and X-linked ichthyosis. Ichthyosis vulgaris is characterized by onset in early childhood, usually between age 3 and 12 months, with fine scales and varying degrees of dryness of the skin. Scaling is most prominent over the trunk, abdomen, buttocks, and legs. The flexural areas, such as the antecubital fossa, are spared. An association may be present between ichthyosis vulgaris and atopic diseases because one third to one half of patients show features of atopic disease and a similar proportion have relatives with atopic disease. A reported 11.5% association is noted between atopic dermatitis and primary hereditary ichthyosis. Ichthyosis vulgaris typically produces no significant ocular findings; however, scaling may be present on the eyelid skin, which could lead to punctate epithelial keratitis and recurrent corneal erosion. Linkage analysis has identified an ichthyosis vulgaris locus on band 1q22. Two loss-of-function mutations in the coding of the filaggrin (filament aggregating protein) gene have been identified in both ichthyosis vulgaris and atopic dermatitis. Keratohyalin synthesis is affected because of the filaggrin mutation. Filaggrin is an epidermal protein that normally functions as a barrier molecule against environmental allergens, water loss, and infection. In epidermolytic hyperkeratosis (bullous ichthyosiform erythroderma), a mild generalized erythroderma is present at birth. Bullae formation may occur, which may become infected and give rise to a foul skin odor. Erythroderma fades in infancy while the characteristic grey, waxy scale progresses. They are particularly prominent in the flexural creases. A mutation in the keratin genes (ie, KRT1, KRT10) is the cause of this autosomal dominant disorder. Lamellar ichthyosis is a rare, autosomal recessive, genetically heterogeneous skin disease caused by mutations involving multiple genetic loci. Type 1 maps to band 14q11.2 and is caused by mutations in the gene for keratinocyte transglutaminase 1, an enzyme responsible for the assembly of the keratinized envelope. Type 2, which is clinically indistinguishable from type 1, maps to band 2q33-q35. In classic lamellar ichthyosis, children with the disease are referred to as collodion babies and are covered at birth by a thickened membrane that subsequently is shed. The scaling of the skin involves the whole body with no sparing of the flexural creases. Approximately one third of children affected with this disorder develop bilateral ectropion of the cicatricial type that appears to result from excessive dryness of the skin and subsequent contracture. Secondary corneal ulceration may occur secondary to long-term exposure. In X-linked ichthyosis, generalized scaling is present at or shortly after birth. This scaling is most prominent over the extremities, neck, trunk, and buttocks. The flexural creases may be involved but palms, and soles are spared. Irregular stromal corneal opacities that are located anterior to the Descemet membrane are found in 16-50% of male patients, and this finding may be used to distinguish this form of ichthyosis from all other forms. Approximately 25% of female carriers have minor corneal opacities. The corneal opacities are not known to affect visual acuity. An example of findings in X-linked ichthyosis is shown in the image below. 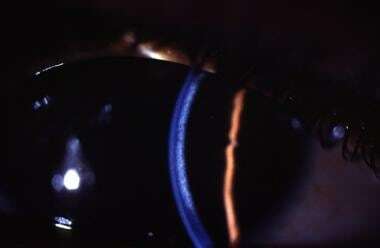 This slit beam illumination photograph of the cornea localizes the corneal opacity to the posterior stroma and the pre-Descemet membrane region. This type of corneal opacity is commonly present in X-linked recessive ichthyosis. Previous studies have shown a deficiency of steroid sulfatase (STS) in skin fibroblasts and a marked elevation of plasma cholesterol sulfate in patients with X-linked ichthyosis. In most cases, STS deficiency is caused by a partial or complete deletion of the STS gene mapped on band Xp22.3. Deletions of the STS gene have systemic effects, such as corneal opacities, cryptorchidism, and failed progression during labor. Deletions to flank regions of the STS gene have been linked with mental retardation. These deletions involve portions of the VCXA and VCXB1 genes. Nonbullous congenital ichthyosiform erythroderma (NBIE) or congenital ichthyosiform erythroderma (CIE) is a milder form of the disease that is autosomal recessive in inheritance. CIE has been found to be caused by mutations in the genes coding for transglutaminase 1, 12R-lipoxygenase, and/or lipoxygenase 3. The lipoxygenase genes play a role in the epidermal permeability layer. As with lamellar ichthyosis, neonates with CIE are referred to as collodion babies, but, as children and adults, they show generalized red skin with thin, white scaling. Other manifestations include persistent ectropion and scarring alopecia. Multiple congenital ectodermal dysplastic syndromes are associated with scaling and other system defects. The keratitis, ichthyosis, and deafness (KID) syndrome is a congenital disorder of ectoderm that affects not only the epidermis but also other ectodermal tissues, such as the corneal epithelium and the inner ear. [3, 4] KID syndrome may present with the Hutchinson triad (the combination of notched, widely spaced peg teeth, interstitial keratitis, and deafness). KID syndrome has been linked to mutations in the connexin (gap junction protein) 26 gene (GJB2) on band 13q11-q12. Colobomas of the eye, heart defects, ichthyosiform dermatosis, mental retardation, and ear defects (CHIME) syndrome comprise a rare neuroectodermal disorder. Netherton syndrome is an autosomal recessive condition that consists of an ichthyosiform dermatosis with variable erythroderma, hair shaft defects, and atopic features. Netherton syndrome has been linked to a mutation on band 5q32, specifically encoding for LEKTI (lymphoepithelial Kazal-type—related inhibitor), a serine protease inhibitor. Sjögren-Larsson syndrome is an autosomal recessive condition that comprises ichthyosis, spastic diplegia, pigmentary retinopathy, and mental retardation. Congenital hemidysplasia with ichthyosiform erythroderma or nevus and limb defects (CHILD) syndrome is a rare X-linked dominant malformation syndrome characterized by unilaterally distributed ichthyosiform erythroderma or nevi, often sharply delimited at the midline, and ipsilateral limb defects. This syndrome is caused by a loss-of-function mutation of nicotinamide adenine dinucleotide phosphate (NADPH) steroid dehydrogenase-like (NSDHL) protein at band Xq28. Acquired ichthyosis usually occurs in adults and manifests as small, white, fishlike scales that frequently are concentrated on the extremities but may be seen in a generalized distribution. This form of ichthyosis may be associated with internal neoplasia (eg, Hodgkin lymphoma, leukemia), systemic illness (eg, sarcoidosis, HIV infection, hypothyroidism, chronic hepatitis, malabsorption), bone marrow transplantation, or the intake of certain medications that interfere with sterol synthesis in epidermal cells (eg, nicotinic acid). Newborns with type 2 Gaucher disease (glucosyl cerebroside lipidosis) may present with ichthyotic skin at birth prior to neurologic manifestations, which could be mistaken for a congenital form of ichthyosis. Ichthyosis vulgaris is the most common form and is an autosomal dominant trait with an incidence of 1 case per 300 population. Epidermolytic hyperkeratosis is an autosomal dominant disorder with an incidence of 1 case per 300,000 population. Lamellar ichthyosis, a more severe form of dermatosis, is an autosomal recessive trait with an incidence of 1 case per 300,000 population. X-linked recessive ichthyosis has an incidence of 1 case per 6000 males. Studies show that a higher prevalence of X-linked ichthyosis as compared to ichthyosis vulgaris may be noted in Mexico, which is markedly different from the experience in the United States. In the United Kingdom, the incidence of ichthyosis vulgaris was reported to be 1 case per 250 population in a study population of 6501 healthy school children. Similarly, in another large epidemiological study, the incidence of X-linked recessive ichthyosis was 1 case in 6190 males. In a Danish population study, the predicted incidence of X-linked recessive ichthyosis was 1 case per 2000 males. In a Danish study, Bygum et al concluded that epidermolytic ichthyosis had a prevalence of approximately 1 in 350,000, with a high percentage of de novo mutations (75%). In southern coastal Italy, the frequency of X-linked recessive ichthyosis was estimated at 1.98 in 10,000 males. In China, ichthyosis vulgaris has a prevalence of 2.29%. An increased risk of testicular cancer in men with ichthyosis vulgaris has been suggested. In addition, an increased incidence of testicular maldescent, cryptorchidism, abnormalities of the sperm count or motility leading to infertility, and testicular cancer has been reported in patients with X-linked recessive ichthyosis. In general, all races may be affected in the inherited and acquired forms of ichthyosis. X-linked recessive ichthyosis is much more prevalent in males. It is caused by a deficiency of STS. Because this enzyme plays an important role in androgen metabolism, men with this ailment do not show androgenetic alopecia or develop only mild forms of this common type of hair loss. The dryness of the eyes can be treated with artificial tears, ointments, bandage contact lenses, punctal occlusion, and possibly surgery, depending on the presence of abnormal lid closure or limbal stem cell deficiency. Any persistent corneal epithelial defect must be treated aggressively to prevent corneal infection. Patients must realize that this condition is chronic, and they will need long-term therapy. Without long-term therapy, the defective permeability barrier associated with ichthyosis can result in a chronic loss of water and calories, which may impair growth in children. [Guideline] Moeschler JB, Shevell M. Clinical genetic evaluation of the child with mental retardation or developmental delays. Pediatrics. 2006 Jun. 117(6):2304-16. [Medline]. Pietrusinski M, Stanczyk-Przyluska A, Chlebna-Sokól D, Borkowska E, Kaluzewski B, Borowiec M. Identification and clinical consequences of a novel mutation in the gene for transglutaminase 1 in a patient with lamellar ichthyosis. Clin Exp Dermatol. 2014 Sep 23. [Medline]. Djalilian AR, Kim JY, Saeed HN, Holland EJ, Chan CC. Histopathology and treatment of corneal disease in keratitis, ichthyosis, and deafness (KID) syndrome. Eye (Lond). 2009 Jul 10. [Medline]. Levit NA, Sellitto C, Wang HZ, Li L, Srinivas M, Brink PR, et al. Aberrant Connexin26 Hemichannels Underlying Keratitis-Ichthyosis-Deafness Syndrome are Potently Inhibited by Mefloquine. J Invest Dermatol. 2014 Sep 17. [Medline]. Bygum A, Virtanen M, Brandrup F, Gånemo A, Sommerlund M, Strauss G, et al. Generalized and Naevoid Epidermolytic Ichthyosis in Denmark: Clinical and Mutational Findings. Acta Derm Venereol. 2012 Aug 29. [Medline]. Scott CA, Rajpopat S, Di WL. Harlequin ichthyosis: ABCA12 mutations underlie defective lipid transport, reduced protease regulation and skin-barrier dysfunction. Cell Tissue Res. 2012 Aug 4. [Medline]. Akiyama M, Suzumori K, Shimizu H. Prenatal diagnosis of harlequin ichthyosis by the examination of keratinized hair canals and amniotic fluid cells at 19 weeks' estimated gestational age. Prenat Diagn. 1999 Feb. 19(2):167-71. [Medline]. Al-Akloby OM. Association of atopic dermatitis with primary hereditary ichthyoses. Saudi Med J. 2004 Aug. 25(8):1097-9. [Medline]. Baden HP, Imber M. Ichthyosis with an unusual constellation of ectodermal dysplasias. Clin Genet. 1989 Jun. 35(6):455-61. [Medline]. Bale SJ, DiGiovanna JJ. Genetic approaches to understanding the keratinopathies. Adv Dermatol. 1997. 12:99-113; discussion 114. [Medline]. Banse-Kupin L, Pelachyk JM. Ichthyosiform sarcoidosis. Report of two cases and a review of the literature. J Am Acad Dermatol. 1987 Oct. 17(4):616-20. [Medline]. Bitoun E, Chavanas S, Irvine AD, Lonie L, Bodemer C, Paradisi M. Netherton syndrome: disease expression and spectrum of SPINK5 mutations in 21 families. J Invest Dermatol. 2002 Feb. 118(2):352-61. [Medline]. Caceres-Rios H, Tamayo-Sanchez L, Duran-Mckinster C, de la Luz Orozco M, Ruiz-Maldonado R. Keratitis, ichthyosis, and deafness (KID syndrome): review of the literature and proposal of a new terminology. Pediatr Dermatol. 1996 Mar-Apr. 13(2):105-13. [Medline]. Casaroli Marano RP, Ortiz Stradtmann MA, Uxo M, Iglesias E. Ocular findings associated with congenital X-linked ichthyosis. Ann Ophthalmol. 1991 May. 23(5):167-72. [Medline]. Chiaretti A, Schembri Wismayer D, Tortorolo L, Piastra M, Polidori G. Salicylate intoxication using a skin ointment. Acta Paediatr. 1997 Mar. 86(3):330-1. [Medline]. Costagliola C, Fabbrocini G, Illiano GM, Scibelli G, Delfino M. Ocular findings in X-linked ichthyosis: a survey on 38 cases. Ophthalmologica. 1991. 202(3):152-5. [Medline]. Cuevas-Covarrubias SA, Diaz-Zagoya JC, Rivera-Vega MR, et al. Higher prevalence of X-linked ichthyosis vs. ichthyosis vulgaris in Mexico. Int J Dermatol. 1999 Jul. 38(7):555-6. [Medline]. Culican SM, Custer PL. Repair of cicatricial ectropion in an infant with harlequin ichthyosis using engineered human skin. Am J Ophthalmol. 2002 Sep. 134(3):442-3. [Medline]. Derse M, Wannke E, Payer H, Rohrbach JM, Zierhut M. [Successful topical cyclosporin A in the therapy of progressive vascularising keratitis in keratitis-ichthyosis-deafness (KID) syndrome (Senter syndrome)]. Klin Monatsbl Augenheilkd. 2002 May. 219(5):383-6. [Medline]. Dilek I, Demirer T, Ustun C, et al. Acquired ichthyosis associated with chronic graft-versus-host disease following allogeneic peripheral blood stem cell transplantation in a patient with chronic myelogenous leukemia. Bone Marrow Transplant. 1998 Jun. 21(11):1159-61. [Medline]. Gicquel JJ, Lami MC, Catier A, Balayre S, Dighiero P. [Limbal stem cell deficiency associated with KID syndrome, about a case]. J Fr Ophtalmol. 2002 Dec. 25(10):1061-4. [Medline]. Gloerich J, Ijlst L, Wanders RJ, Ferdinandusse S. Bezafibrate induces FALDH in human fibroblasts; implications for Sjögren-Larsson syndrome. Mol Genet Metab. 2006 Sep-Oct. 89(1-2):111-5. [Medline]. Happle R, Hoffmann R. Absence of male-pattern baldness in men with X-linked recessive ichthyosis? A hypothesis to be challenged. Dermatology. 1999. 198(3):231-2. [Medline]. Hazan C, Orlow SJ, Schaffer JV. X-linked recessive ichthyosis. Dermatol Online J. 2005. 11(4):12. [Medline]. Hoffjan S, Stemmler S. On the role of the epidermal differentiation complex in ichthyosis vulgaris, atopic dermatitis and psoriasis. Br J Dermatol. 2007 Sep. 157(3):441-9. [Medline]. Hosomi N, Oiso N, Fukai K, Hanada K, Fujita H, Ishii M. Deletion of distal promoter of VCXA in a patient with X-linked ichthyosis associated with borderline mental retardation. J Dermatol Sci. 2007 Jan. 45(1):31-6. [Medline]. Hummel M, Cunningham D, Mullett CJ, Kelley RI, Herman GE. Left-sided CHILD syndrome caused by a nonsense mutation in the NSDHL gene. Am J Med Genet A. 2003 Oct 15. 122(3):246-51. [Medline]. Ingordo V, D'Andria G, Gentile C, Decuzzi M, Mascia E, Naldi L. Frequency of X-linked ichthyosis in coastal southern Italy: a study on a representative sample of a young male population. Dermatology. 2003. 207(2):148-50. [Medline]. Kawashima J, Akiyama M, Takizawa Y, Takahashi S, Matsuo I, Shimizu H. Structural, enzymatic and molecular studies in a series of nonbullous congenital ichthyosiform erythroderma patients. Clin Exp Dermatol. 2005 Jul. 30(4):429-31. [Medline]. Kuster W, Bohnsack K, Rippke F, et al. Efficacy of urea therapy in children with ichthyosis. A multicenter randomized, placebo-controlled, double-blind, semilateral study. Dermatology. 1998. 196(2):217-22. [Medline]. König A, Happle R, Bornholdt D, Engel H, Grzeschik KH. Mutations in the NSDHL gene, encoding a 3beta-hydroxysteroid dehydrogenase, cause CHILD syndrome. Am J Med Genet. 2000 Feb 14. 90(4):339-46. [Medline]. Lacz NL, Schwartz RA, Kihiczak G. Epidermolytic hyperkeratosis: a keratin 1 or 10 mutational event. Int J Dermatol. 2005 Jan. 44(1):1-6. [Medline]. Leung PC, Ma GF. Ectropion of all four eyelids associated with severe ichthyosis congenita: a case report. Br J Plast Surg. 1981 Jul. 34(3):302-4. [Medline]. Lucker GP, Heremans AM, Boegheim PJ, van de Kerkhof PC, Steijlen PM. Oral treatment of ichthyosis by the cytochrome P-450 inhibitor liarozole. Br J Dermatol. 1997 Jan. 136(1):71-5. [Medline]. Marulli GC, Campione E, Chimenti MS, Terrinoni A, Melino G, Bianchi L. Type I lamellar ichthyosis improved by tazarotene 0.1% gel. Clin Exp Dermatol. 2003 Jul. 28(4):391-3. [Medline]. Mayuzumi N, Ikeda S, Kawada H, Ogawa H. Effects of drugs and anticytokine antibodies on expression of ATP2A2 and ATP2C1 in cultured normal human keratinocytes. Br J Dermatol. 2005 May. 152(5):920-4. [Medline]. Messmer EM, Kenyon KR, Rittinger O, Janecke AR, Kampik A. Ocular manifestations of keratitis-ichthyosis-deafness (KID) syndrome. Ophthalmology. 2005 Feb. 112(2):e1-6. [Medline]. Montague I, Fox R, Mann R. Intra-amniotic debris identified at ultrasound scanning: a feature of congenital ichthyosis. Ultrasound Obstet Gynecol. 1997 May. 9(5):350-1. [Medline]. Moran JL, Qiu H, Turbe-Doan A, et al. A mouse mutation in the 12R-lipoxygenase, Alox12b, disrupts formation of the epidermal permeability barrier. J Invest Dermatol. 2007 Aug. 127(8):1893-7. [Medline]. Moskowitz DG, Fowler AJ, Heyman MB, et al. Pathophysiologic basis for growth failure in children with ichthyosis: an evaluation of cutaneous ultrastructure, epidermal permeability barrier function, and energy expenditure. J Pediatr. 2004 Jul. 145(1):82-92. [Medline]. Oji V, Beljan G, Beier K, Traupe H, Luger TA. Topical pimecrolimus: a novel therapeutic option for Netherton syndrome. Br J Dermatol. 2005 Nov. 153(5):1067-8. [Medline]. Orth DH, Fretzin DF, Abramson V. Collodion baby with transient bilateral upper lid ectropion. Review of ocular manifestations in ichthyosis. Arch Ophthalmol. 1974 Mar. 91(3):206-7. [Medline]. Pagliaro JA, White SI. Specific skin lesions occurring in a patient with Hodgkin's lymphoma. Australas J Dermatol. 1999 Feb. 40(1):41-3. [Medline]. Patel N, Spencer LA, English JC 3rd, Zirwas MJ. Acquired ichthyosis. J Am Acad Dermatol. 2006 Oct. 55(4):647-56. [Medline]. Richard G, Rouan F, Willoughby CE, et al. Missense mutations in GJB2 encoding connexin-26 cause the ectodermal dysplasia keratitis-ichthyosis-deafness syndrome. Am J Hum Genet. 2002 May. 70(5):1341-8. [Medline]. [Full Text]. Sarici SU, Sahin M, Yurdakök M. Topical N-acetylcysteine treatment in neonatal ichthyosis. Turk J Pediatr. 2003 Jul-Sep. 45(3):245-7. [Medline]. Schnur RE, Greenbaum BH, Heymann WR, et al. Acute lymphoblastic leukemia in a child with the CHIME neuroectodermal dysplasia syndrome. Am J Med Genet. 1997 Oct 3. 72(1):24-9. [Medline]. Schorderet DF, Huber M, Laurini RN, et al. Prenatal diagnosis of lamellar ichthyosis by direct mutational analysis of the keratinocyte transglutaminase gene. Prenat Diagn. 1997 May. 17(5):483-6. [Medline]. Shwayder T. Disorders of keratinization: diagnosis and management. Am J Clin Dermatol. 2004. 5(1):17-29. [Medline]. Sun JD, Linden KG. Netherton syndrome: a case report and review of the literature. Int J Dermatol. 2006 Jun. 45(6):693-7. [Medline]. Suresh S, Vijayalakshmi R, Indrani S, Lata M. Short foot length: a diagnostic pointer for harlequin ichthyosis. J Ultrasound Med. 2004 Dec. 23(12):1653-7. [Medline]. Takechi K, Sekiguchi K, Goto S. [A case of keratitis, ichthyosis, and deafness syndrome with Hutchinson's triad-like symptoms]. Nippon Ganka Gakkai Zasshi. 1999 Apr. 103(4):322-6. [Medline]. Thiers BH. The use of topical calcipotriene/calcipotriol in conditions other than plaque-type psoriasis. J Am Acad Dermatol. 1997 Sep. 37(3 Pt 2):S69-71. [Medline]. Traboulsi E, Waked N, Megarbane H. Ocular findings in ichthyosis follicularis-alopecia-photophobia (IFAP) syndrome. Ophthalmic Genet. 2004 Jun. 25(2):153-6. [Medline]. Tsochatzis E, Vassilopoulos D, Deutsch M, Asvesti C, Sevastos N, Archimandritis AJ. Myelodysplastic syndrome presenting as acquired ichthyosis. Eur J Intern Med. 2006 Aug. 17(5):368-9. [Medline]. This direct illumination slit lamp photograph discloses a reticular central corneal haze that is seen bilaterally. Visual acuity is 20/20 in both eyes. The patient's chief complaint is photophobia and dry scaly skin. An orbital mass is shown on CT scan in a 38-year-old male with human immunodeficiency virus (HIV) who presented with a late onset generalized ichthyotic rash and proptosis.